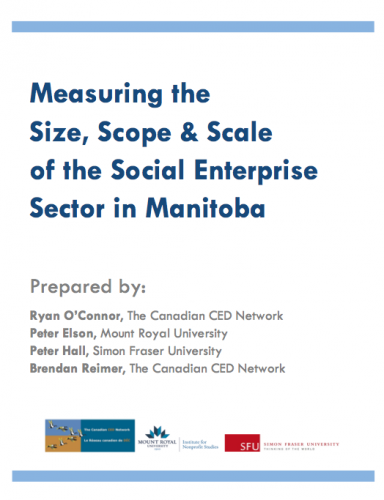 In the summer of 2011, 118 social enterprises across Manitoba were surveyed in an effort to develop clear indicators of the sector's size, market activities, and socio-economic impacts. Although the results are prelimary, this report builds a strong case for all stakeholders to value the distinct contributions of social enterprises and to work together in creating a supportive environment in which the sector can grow. This report builds on research that was conducted on the social enterprise sectors in British Columbia and Alberta. Similar projects are also underway in Ontario and Eastern Canada in an effort to measure and quanitfy the impacts of social enterprises across Canada. If you would like to learn more about this research or the social enterprise sector in Manitoba, contact Brendan Reimer at breimer@ccednet-rcdec.ca or at 927-3203.